Group Of Children Wearing Colourful Wireless Headsets While Working On Digital Tablets, A Little Boy Can Be Seen Smiling In The Foreground Looking At Camera. Royalty Free Fotografie A Reklamní Fotografie. Image 43346181. Reklamní fotografie - Group of children wearing colourful wireless headsets while working on digital tablets, a little boy can be seen smiling in the foreground looking at camera. 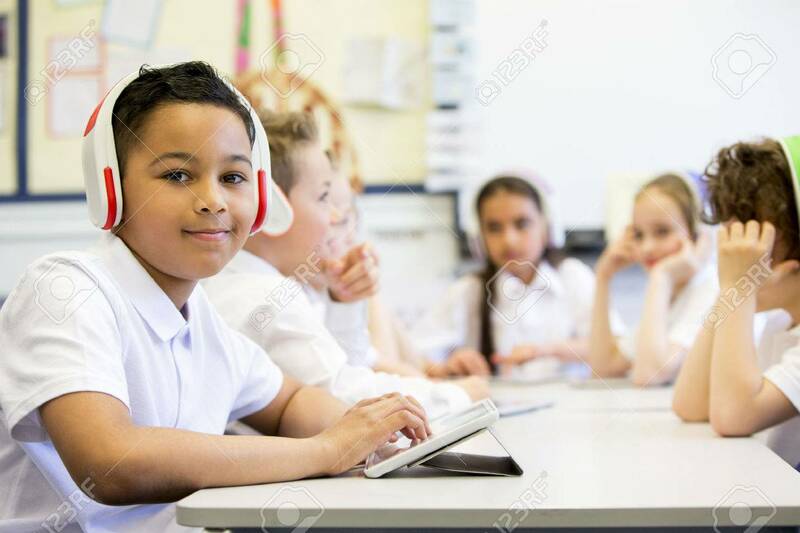 Group of children wearing colourful wireless headsets while working on digital tablets, a little boy can be seen smiling in the foreground looking at camera.